Two matches from the show I won’t be reviewing – the Y Dress Battle Royal was not added to the WAVE Network for whatever reason, and the Kashin/Michinoku vs. Togo/Goto match I am skipping since I am focusing on the Joshi matches. All the wrestlers on the show have a profile on Joshi City, you can click on their names above to go directly to it. This is officially an Exhibition Match so it has a five minute time limit. GAMI is the promoter of Pro Wrestling WAVE and actually retired a few years ago, but she sometimes takes part in Battle Royals or Exhibition matches if the opportunity presents itself. Chigusa Nagayo is the promoter of Marvelous, she doesn’t wrestle much anymore but stays active enough that she hasn’t had any retirement shows in awhile. Chigusa Nagayo and GAMI don’t have a traditional rivalry from their heyday or anything like that, so its just two long time veterans having some fun before Nagayo retires for good one day. Nagayo kicks GAMI in the leg to start the match, GAMI immediately retreats to the corner and asks for an ice pack for it. She comes back out while limping, chop to the chest by Nagayo but GAMI gets her noise maker and hits the referee in the head with it. She then tosses it to Nagayo and claims it was Nagayo that hit the referee, GAMI kicks Nagayo and bounces her off the ropes. Kick to the chest by GAMI, and she covers Nagayo for two. GAMI gets her weapon and hits Nagayo a couple times with it, Nagayo gets to the ropes and the referee gives her a moment to recover. Kicks by Nagayo and she punches GAMI in the chest, cover by Nagayo but GAMI kicks out. Wristlock by GAMI, she climbs up the corner and walks the top rope, but the bell rings as time has expired. The match is a Draw. Ok look, you have to watch matches like these from a different perspective. Clearly, ‘workrate’ wise this was not a good match. GAMI is no longer an active wrestler, while Nagayo is 52 years old and a bit broken. But they were having fun and the crowd enjoyed seeing two classic wrestlers mixing it up. We aren’t done seeing them yet as they are having a match series, for their next match they will be in tag action. This is really only for long time fans that just want to see Nagayo and GAMI lock up, everyone else can safely skip it. Cherry and Kaori won the titles on July 2nd from Yuki Miyazaki and Yumi Ohka, and this is their first defense. Neither are WAVE wrestlers, as Kaori is a Freelancer affiliated with YMZ while Cherry primarily wrestles in DDT. Hiroe Nagahama and Kaho Kobayashi are not a regular tag team, as Kaho doesn’t wrestle in WAVE very much herself. Hiroe is the only contracted WAVE wrestler in this match, she is 21 years old and is looking for her first championship victory. Hiroe and Kaori start the match, Kaho quickly comes in to help her partner and they stomp down Kaori. Double dropkick to Kaori but Cherry breaks things up, Hiroe is now double teamed until Kaori tags in Cherry. Cherry rolls Hiroe to the mat and elbows her, slaps by Cherry and she kicks Hiroe into the ropes. Kaori is tagged back in and she throws down Hiroe by the hair, Cherry returns as they take turns on the young WAVE wrestler. Hiroe fights back with a crossbody and makes the hot tag to Kaho, Kaho dropkicks both Cherry and Hiroe and goes for a double crossbody, but she gets caught. Kaho flings them both to the mat anyway, Kaho throws Cherry into the corner and she hits a dropkick. Running senton by Kaho, but Cherry bridges out of the pin. Back up they trade elbows, eye poke by Cherry and she forces the referee to help her out. Cover by Cherry, but Kaho kicks out at two. Kaho elbows Cherry and goes off the ropes, but Cherry catches her with Cutie Special for another two. Cherry tags Kaori, Kaori knees Kaho in the back of the head but Kaho blocks her chops. Kick by Kaori and she goes off the ropes, but Kaho delivers a dropkick. Another dropkick by Kaho and she hits the fisherman suplex hold for a two count. Kaho tags Hiroe, dropkicks by Hiroe and she goes up top, hitting a missile dropkick for two. Hiroe picks up Kaori and hits the Northern Lights Suplex, but Cherry breaks it up. Cherry and Kaori are stacked in the corner but they avoid Hiroe’s charge and send Kaho out of the ring. Hiroe is slammed near the corner, diving senton by Kaori and Cherry follows with the Swanton Bomb, but Kaho returns in time to break up the cover. Cherry and Kaori pick up Hiroe but Kaho runs in again and dropkicks both of them, they avoid Kaho’s next dropkick and they cradle Hiroe, but Kaho once again breaks it up. Kaori goes for the Chaos Theory but Hiroe blocks it, Cherry chops Kaori by accident and Hiroe cradles Kaori for two. Kaho kicks Kaori from the apron, Hiroe quickly puts Kaori in the Hiroe Special and she picks up the three count! Hiroe Nagahama and Kaho Kobayashi are the new champions! I don’t feel this match needs a ton of explanation. Nihonbashi, Ranmaru, and Hirota are all comedy wrestlers for the most part, so that negates any chance of this match been particularly serious. The other team does have all serious wrestlers (for the most part) but I think we can safely assume this match will have shenanigans. Still, depending on how the comedy is done it could still be an entertaining match, especially with Hana and Hikaru involved. Hana and Hirota start the match, dropkick by Hana and she covers her for the three count! Hana Kimura and friends win! Hirota gets on the mic and I am assuming wants the match to re-start, and she eventually gets her wish. Hirota and Mio Momono start the rematch, dropkick by Mio and she covers Hirota for three once again! Hana Kimura and friends win! Well Hirota still isn’t satisfied so the match re-starts again with Rin and Hirota, dropkick by Rin and she covers Hirota, but this time Hirota barely kicks out. Hirota Oil Checks Rin and tags out, Hikaru tags in too but she is double teamed by Ranmaru and Mii. Hikaru gets her kendo stick and tries to hit Ranmaru with it, eventually succeeding. Ranmaru rolls out of the ring while Fairy gets in it with her wand, and she uses it to deflect Hikaru’s kendo stick. Fairy flings all her opponents with the wand, Hirota comes in while all their opponents are lying on the ring, she goes off the ropes and hits a running splash of sorts onto everyone. Both teams ram into each other in the middle of the ring, almost causing them all to be counted down for three, but the eight wrestlers get their shoulders up. They trade finishers with each other until Hikaru is in the ring with Mii, Tamashi no Three Count by Hikaru to Mii and she picks up the three count! Hana Kimura and friends officially finally win the match! This match was, as the kids would say, a Nothing Burger. Even though it was Hirota’s first official match since 2015, it certainly didn’t feel special in any way. I so rarely get to see Hibiscus Mii and Ranmaru that I wish the action wasn’t so short, as it didn’t give anyone time to make an impact. I guess it functioned as a cute little midcard match, but even comedy lovers probably would want a bit more than what we were given here. On paper this match doesn’t look special, and while it mostly isn’t, the inclusion of Nagisa Nozaki is notable. Nagisa retired back in 2013 after a stint in WNC, and while she was a respected veteran she never managed to reach too far up the card while in NEO or Smash/WNC. After a four year hiatus, she announced a return for Pro Wrestling WAVE, and since she is only 26 years old she still has a chance to climb to success if she sticks with it. Everyone else is your standard WAVE affair, so hopefully Nagisa looks good in her first match back. Aoi and Yuki start the match, Yuki pushes Aoi against the ropes but Nagisa comes in to help even things out. Yuki lariats both of them for their trouble, Mika comes in and puts on Aoi’s wings while Yuki puts Aoi in a compromising position. Nagisa comes in to break up the fun, Mika stays in with Aoi and hits a pair of falling headbutts. Yuki walks back over and covers Aoi for two, Irish whip by Yuki but Aoi hits a jumping lariat. Yuki doesn’t go down however and dropkicks Aoi in the head, Mika then comes in and she dropkicks Aoi as well. Yuki picks up Aoi but Aoi snaps off a German suplex, jumping lariat by Aoi and she hits the double wrist clutch suplex for a two count. Aoi goes up top but Yuki avoids the swivel body press, Mika comes in but Aoi moves when Yuki tries to slam Mika onto her. Aoi puts Yuki in a stretch hold with Nagisa’s help, but Yuki fights them both off. German by Yuki but Aoi pops back to her feet and hits a German of her own. Aoi tags in Nagisa, Nagisa goes for a kick but Yuki shoves her to the mat. Elbows by Nagisa but Yuki fires back with a lariat, Yuki goes up top but Aoi grabs her from the apron, allowing Nagisa to German her off the top turnbuckle to the mat. Nagisa goes up top but Yuki joins her before suplexing Nagisa back down, DDT by Yuki and this time she succeeds in slamming Mika on top of her. Yuki goes up top but Nagisa avoids the moonsault, Nagisa goes off the ropes but Yuki catches her with a Samoan Driver. Yuki tags in Mika, uppercut by Mika and she then hits a running uppercut. Nagisa and Mika trade elbows, big boot by Nagisa but Mika avoids her charge in the corner and snaps her arm over the top rope. Mika boots Nagisa in the head but Nagisa puts her in a sleeper, Yuki grabs Nagisa from behind and suplexes her into the turnbuckles. Dropkick by Mika to Nagisa, she goes up top and delivers a missile dropkick for a two count. Aoi comes in to get Nagisa back in control, butterfly suplex by Nagisa and she covers Mika for two. Sleeper by Nagisa but Mika rolls out of it, Nagisa charges Mika and nails a running knee, but Yuki breaks up the cover. Nagisa hits a modified STO before cranking on Mika’s arm, but Yuki breaks up the submission. Nagisa goes for a boot but Mika ducks and puts Nagisa in a short armbar, cross armbreaker by Mika but Nagisa gets a foot on the ropes. Mika goes off the ropes but Nagisa boots her in the face, she goes for another boot but Yuki comes in and distracts the referee. Modified sunset flip by Mika, and she holds down Nagisa for the three count! Mika Iida and Yuki Miyazaki win the match. I will give Nagisa credit – she looked a little rusty but she was in the bulk of the match and took a lot of big bumps, so she wasn’t taking it easy. Nagisa was never, in my opinion, a high end wrestler but she is good at submissions/strikes and can hang with most wrestlers. Really, the other three aren’t high end wrestlers either so it was a fair pairing, a decent midcard match but nothing overly exciting. 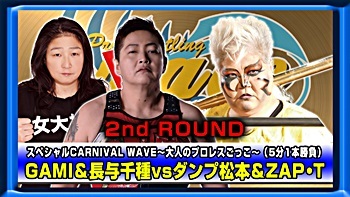 The Chigusa Nagayo and GAMI series continues, but this time against two legendary wrestlers – Dump Matsumoto and Zap T! Matsumoto is one of my guilty pleasures, I think she is one of the top Joshi characters ever and while she isn’t in peak shape anymore, I still love seeing her. Zap T is better known as Tomoko Watanabe, Zap T is a gimmick from her days in AJW but she has used the name a few times since then when teaming with Zap I (Kaoru Ito). This is a match I never thought I’d see but here we are, let’s see how it goes. GAMI and Chigusa charges Matsumoto and Zap T as they come through the curtain and they brawl on the stage, which quickly backfires as Matsumoto stabs GAMI in the head. Matsumoto brings GAMI back to ringside and into the ring, where she hits GAMI in the head with a kendo stick. Matsumoto stabs GAMI in the head some while GAMI bleeds, Zap T comes in too and puts GAMI in a camel clutch of sorts. Zap T stays in as the legal wrestler but GAMI elbows her against the ropes, scoop slam by GAMI and she tags in Chigusa. Elbows by Chigusa but Zap T kicks her back, Matsumoto gets Chigusa in the corner and tries to stab her, but Chigusa blocks it. Zap T clubs Chigusa while Matsumoto gets her paint can, but she hits Zap T by accident. GAMI and Chigusa double team Zap T, Chigusa then trips Matsumoto and puts her in the Scorpion Deathlock of sorts. Around this time the bell mercifully rings, as the five minutes has expired. The match is a Draw. Ok so I said I love Matsumoto, and I do, but her physical condition has gotten worse since I last saw her and she had trouble even standing. GAMI is still pretty spry as is Watanabe, but Matsumoto’s situation just dragged down the match. I still love her and always will, but even with my strongest nostalgic goggles I can’t recommend this. A bit of random teams here, but lots of quality wrestlers. And a rookie. 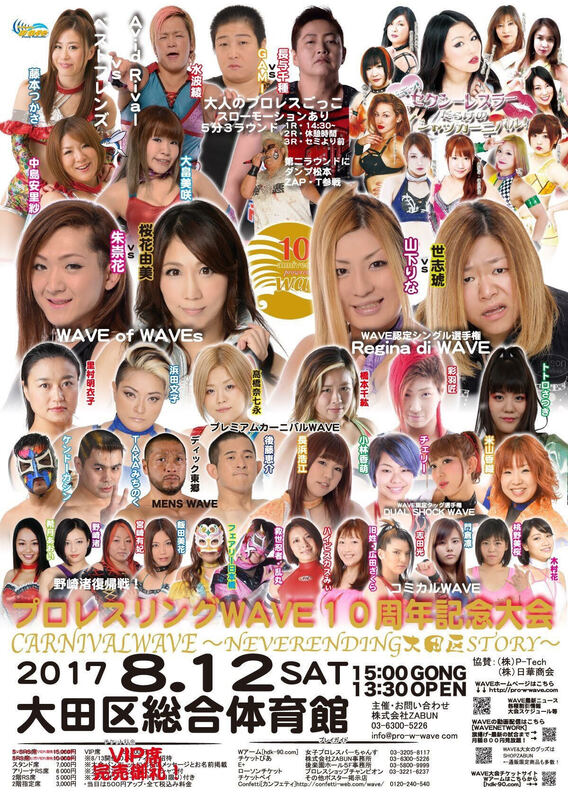 Ayako Hamada wrestles primarily for WAVE, but none of the others are WAVE wrestlers. Meiko and Chihiro are the two biggest wrestlers from Sendai Girls’, while Nanae Takahashi is the promoter of SEAdLINNNG. Takumi Iroha is the young Ace of Marvelous, which just leaves Satsuki Totoro – a mostly unknown rookie from Ice Ribbon. No idea how she is in this match, but everyone else is great so I expect some fireworks. Satsuki and Meiko begin for their teams and quickly trade elbows, they go into a tie-up and Meiko takes Satsuki to the mat. Satsuki gets to the ropes to force a break, Meiko quickly applies a short armbar but again Satsuki reaches the ropes. Meiko isn’t done schooling the rookie as she puts Satsuki in a kneelock, but Satsuki breaks the hold for the third time. Meiko tags in Nanae and elbows Satsuki in the corner, chops by Nanae and she hits a leg drop. Nanae tags in Hamada, kicks by Hamada and she covers Satsuki for two. Short armbar by Hamada and she puts Satsuki in a stretch hold, but Iroha runs in to break it up. Satsuki finally hits a move as she delivers a crossbody, giving her time to tag in Iroha. Iroha kicks Hamada to the mat but Hamada hits a vertical suplex before tagging in Meiko. Iroha elbows Meiko in the corner but Meiko elbows her back, kicks by Meiko and she shoves the referee down when she tries to slow down Meiko’s assault. Iroha fires back with kicks and she puts Meiko in a Scorpion Deathlock, but Nanae breaks it up with a hard slap. Lariat by Nanae to Iroha and Meiko delivers the cartwheel kneedrop, Meiko tags in Nanae and Nanae slaps Iroha into the corner, lariat by Nanae but Iroha kicks her in the chin. Suplex by Nanae and she goes for an ankle hold, but Chihiro breaks it up. Lariats by Nanae and she drops Iroha with a backdrop suplex, she goes off the ropes but Iroha hits an elbow. Superkick by Iroha, she goes up top and nails a Swanton Bomb, but Nanae barely kicks out. Iroha tags in Chihiro, somersault sentons by Chihiro and she covers Nanae for two. Nanae slaps Chihiro into the corner but Chihiro fires back, lariat by Chihiro but Nanae knocks her down with a lariat of her own. Nanae goes off the ropes but Chihiro lariats Nanae to the mat, Iroha comes in but Nanae lariats both of them. Nanae tags in Hamada, Hamada goes up top and hits a missile dropkick. Chihiro gets back up and the two trade elbows, Nanae and Meiko both get in the ring and they help Hamada take over the match. Chihiro gets Hamada’s back and drops her with a release German, giving her time to tag in Satsuki. Shoulderblocks by Satsuki but Hamada kicks out of the cover, Nanae comes in to try to help but she kicks Hamada by accident. Satsuki and Chihiro both hit sentons, Satsuki goes up top and she hits a somersault senton onto Hamada for a two count. All six wrestlers end up in the ring and Team Hamada all hit signature moves, powerbomb by Hamada to Iroha and Meiko hits a diving bodypress. Chihiro spears both Hamada and Meiko but Hamada ends up alone with Satsuki again, superkick by Hamada but the cover is broken up. Another superkick by Hamada, and this time she gets the three count! Ayako Hamada, Meiko Satomura, and Nanae Takahashi pick up the win! This is the first match on the card I was really looking forward to, as the two top current tag teams in Joshi wrestling collide. Arisa Nakajima and Tsukasa Fujimoto are known as Best Friends, and they dominated tag team wrestling in 2015 and 2016. After a bit of a break from each other they have been teaming more often the last few weeks, even though both are in different promotions they still manage to tag up fairly often. Misaki Ohata and Ryo Mizunami, known as Avid Rival, are the top tag team in WAVE and so far in 2017 have held both the WAVE Tag Team Championship and the Ice Ribbon International Ribbon Tag Team Championship. This is the first time these two teams have met since 2015, and even though no titles are on the line here, neither team will hold anything back. Its also the first match in a planned Trilogy between the two teams. Misaki and Tsukasa start the match but Arisa kicks Misaki from behind, double dropkick to Misaki but Ryo comes in to help as well. Ryo and Misaki both hit running strikes in the corner but Tsukasa dropkicks them out of the ring, Arisa and Tsukasa go to different corners and dive out of the ring onto their opponents. Tsukasa slides Misaki back in and puts Misaki in the ropes, dropkick by Tsukasa to the back and she covers Misaki for two. Misaki bridges out of it and rolls up Tsukasa, but Tsukasa kicks out of it and delivers a dropkick. Both wrestlers tag out, boots by Arisa to Ryo but Ryo fires back with elbows. Hard shoulderblock by Ryo but Tsukasa runs in and dropkicks her, running knee by Arisa to Ryo but Ryo avoids their kick and Misaki dives off the top turnbuckle with a crossbody. Double spear by Ryo and she lariats Arisa in the corner, cover by Ryo but it gets a two count. Ryo tags Misaki, low crossbody by Misaki and she goes for a Stunner, but Arisa blocks it and hits a release German. Misaki comes right back with a German of her own, but Arisa hits a footstomp to her stomach and both wrestlers get back up to trade elbows. Spinning back chop by Misaki but Arisa catches her with the Cutie Special for a two count. Arisa tags Tsukasa, missile dropkick by Tsukasa and she nails Misaki with a dropkick in the corner. Tsukasa goes for a PK but Misaki catches her leg, Arisa boots Misaki and Tsukasa delivers a PK for a two count. Tsukasa charges the corner but Misaki grabs her by the waist, she goes for a German but Tsukasa lands on her feet. Tsukasa gets Misaki on her shoulders but Misaki slides away, Arisa hits a German suplex onto Misaki and Tsukasa applies a jackknife for a two count. Tsukasa goes for the Venus Shoot but Ryo breaks it up, she gets Tsukasa on her shoulders and tosses her to the mat while Misaki hits a diving crossbody. Ryo lariats Arisa and Misaki covers her for two before rolling to her corner to tag in Ryo. Spear by Ryo but Tsukasa boots her, overhead suplex by Ryo but Tsukasa blocks the dragon suplex. Arisa hits a missile dropkick onto Ryo and Ryo eats a double kick to the head, but she kicks out of the pin attempt. Uranage by Ryo to Tsukasa for two, she goes up top but Tsukasa joins her and armdrags Ryo to the mat. Arisa hits a diving footstomp onto Ryo, cover by Tsukasa but Misaki breaks it up. Infinity by Tsukasa, but Ryo barely kicks out. Tsukasa gets Ryo on her shoulders but Ryo slides off, Tsukasa goes off the ropes but Misaki runs in and hits a German suplex. Hard lariat by Ryo and she nails a dragon suplex hold, but Arisa breaks it up. Ryo picks up Tsukasa but Arisa elbows her, Arisa goes off the ropes but she is caught with the 3D. Reverse Hurricanrana into a roll-up by Tsukasa, but it only gets a two count. Enzuigiri by Tsukasa but Ryo fires back with a lariat, Tsukadora by Tsukasa but Misaki breaks it up. Misaki and Ryo hit a double tombstone piledriver onto Tsukasa, Ryo goes up top and nails the guillotine legdrop, but Arisa breaks up her cover. Misaki takes care of Arisa while Ryo picks up Tsukasa and nails the Hot Limit for the three count! Avid Rivals win! To give the crowd a bit of a break, we have the final match in the Chigusa Nagayo vs. GAMI series. This match also has a five minute time limit as they are officially exhibition matches, GAMI is all bandaged up from the last match so she comes in more injured than her opponent. Nagayo traps GAMI in the corner and hits a hard elbow, more strikes by Nagayo but she can’t get GAMI off her feet. GAMI pushes Nagayo into the corner and punches her, mounted punches by GAMI and she spits water on her. A Count Down begins as the two wrestlers start wrestling in slow motion, they trade lariats (still in slow motion) until GAMI stomps on Nagayo’s foot. Lariat by Nagayo as the Count Down expires and they go back to full speed, Nagayo puts GAMI in the Scorpion Deathlock but lets her go after a moment. Heel kick by Nagayo but GAMI ducks the second one, small package by GAMI and she picks up the three count! GAMI wins! The surprising thing here was simply that they had a pinfall instead of going to a Draw like everyone assumed. Nothing much to it and the slow motion part was a bit odd since in theory it wasn’t a comedy match, but it was really just nostalgic filler. A good time was had by all, but not exactly a high-end wrestling affair. After that match, we now jump to on paper the biggest match of the night. 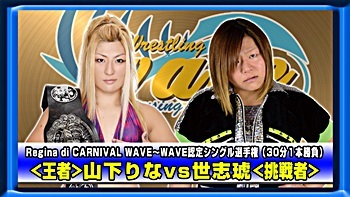 Even though Rina and Yoshiko wrestle in different promotions (WAVE and SEAdLINNNG, respectively), they have had a simmering feud for much of the year. After facing off in a few tag matches, they had their first singles match on May 24th, which Yoshiko won. That was enough to earn her the shot at the top title in Pro Wrestling WAVE. Rina Yamashita won the championship on July 2nd against Ryo Mizunami, and this is her first defense of the title. They start slowly with a tie-up and trading holds, Rina bites Yoshiko and they end up back at a stalemate. Yoshiko tosses down Rina by the hair and bootscrapes her in the corner, but Rina fires back with an elbow and returns the favor. Rina picks up Yoshiko but Yoshiko snapmares her and puts Rina in a chinlock, Yoshiko bites Rina again before putting her in a side headlock. Rina Irish whips out of it and applies a side headlock of her own, Yoshiko gets out of it and they collide into each other with neither going down. Rina finally shoulderblocks Yoshiko to the mat, she picks up Yoshiko but Yoshiko springs out of the corner with a lariat and boots Rina while she is against the ropes. Rina falls out of the ring but Yoshiko goes out after her, hitting a seated senton from the apron to the floor. Yoshiko goes for a running senton but Rina rolls out of the way and hits a senton of her own, she then grabs Nanae Takahashi and suplexes her onto Yoshiko. Rina gets a really really long running start and hits a senton still on the floor, she gets Yoshiko back into the ring and puts her in the Scorpion Deathlock, but Yoshiko makes it to the ropes for the break. Running knee by Rina, she gets out on the apron and knees Yoshiko in the head again before covering her for a two count. Rina picks up Yoshiko but Yoshiko hits a strike combination before connecting with the senton for a two count. Rina quickly applies the sleeper hold, Yoshiko gets out of it and she lariats Rina in the corner. Rina picks up Yoshiko and slams her into the opposite corner, lariats by Rina and she hits a vertical suplex. Rina gets on the second turnbuckle and hits a diving elbow drop, but the cover gets two. Rina goes all the way up this time but Yoshiko recovers and joins her, Yoshiko gets Rina on her shoulders but Rina slides off and back to the mat. Rina goes for the powerbomb and eventually gets it, cover by Rina but Yoshiko kicks out. Rina picks up Yoshiko but Yoshiko hits a back bodydrop before kicking Rina in the chest. Senton by Yoshiko, she picks up Rina but Rina wiggles away and hits a superkick. Both wrestlers go off the ropes but Yoshiko levels Rina with a lariat, she picks up Rina and delivers a fireman’s carry slam for a two count. Yoshiko gets on the second turnbuckle and hits the diving senton, but Rina barely gets a shoulder up. Yoshiko goes to the top turnbuckle but Rina rolls out of the way of the diving senton, both wrestlers slowly get up and they trade elbows. They then start trading lariats until Rina clubs Yoshiko to the mat, sliding lariat by Rina but Yoshiko kicks out of the cover. Rina waits for Yoshiko to get up and charges her, but Yoshiko ducks and hits a short-range lariat. Sliding lariat by Yoshiko, but Rina reverses her cover into one of her own for two. Yoshiko blocks one Rina lariat but not the second one, Rainmaker by Rina but it gets a two count cover. Rina goes off the ropes and nails another lariat, but Yoshiko won’t stay down. Another lariat by Rina, and this time she gets the three count! Rina Yamashita is still the champion. I wish I knew the backstory on why this match went on after the title match, but I would only be theorizing. ASUKA is the top rising star of Pro Wrestling WAVE. She is only 18 years old and debuted two years ago, but has already shown an ability to hang with anyone in the promotion and she has improved exponentially in the last year. ASUKA is the first transgender wrestler in Joshi wrestling, but WAVE doesn’t seem to try to capitalize on that and has treated ASUKA just like any other young wrestler. But she has been successful enough to earn a singles match against Yumi Ohka, one of the senior members of WAVE and a solid “gatekeeper” for wrestlers that want to reach the main event. This is easily the biggest match of ASUKA’s career, and she has a lot of pressure on her to show why WAVE has so much faith in her. ASUKA and Ohka quickly end up on the mat to trade holds, ASUKA applies a front necklock but Ohka quickly gets out of it and applies a side headlock. They end up facing off on their feet again, wristlock by Ohka but ASUKA reverses it. Ohka gets the headlock re-applied but ASUKA gets out of it, headscissors by ASUKA and she kips up, but Ohka ducks the springboard crossbody. Ohka throws ASUKA into the corner but ASUKA moonsaults out of it, Ohka stomps ASUKA anyway before ASUKA goes for a Space Rolling Elbow, but Ohka kicks her in the back to block it. Running boot by Ohka in the corner but ASUKA comes back with an elbow, another boot by Ohka and she covers ASUKA for two. Ohka picks up ASUKA but ASUKA hits the springboard crossbody this time, Ohka returns with a cross-arm slam but ASUKA puts her in a crucifix armbar. Ohka reverses that into the Stretch Muffler but ASUKA reverses it back again as they trade submission holds until they end up in the ropes. Ohka is up first and boots ASUKA in the head, cover by Ohka but it gets two. Ohka goes off the ropes again but ASUKA duck the boot this time and applies an ankle hold, but Ohka quickly gets out of it. Ohka applies a hanging headscissors over the top rope, she then brings ASUKA to the middle of the ring and applies a cross-arm submission, but ASUKA gets to the ropes. Ohka goes up top but ASUKA smacks her before she can jump off, ASUKA joins her but Ohka knocks ASUKA back to the mat. ASUKA joins Ohka again, Ohka knocks her off but ASUKA hits a springboard side slam. Standing moonsault attempt by ASUKA, but Ohka reverses it into an armbar necklock submission. ASUKA gets in the ropes, Ohka picks her up but ASUKA blocks the suplex attempt and drops Ohka onto the apron. Ohka keeps a hold on ASUKA to snap her over the top rope, heel drop by Ohka on the apron and she goes to the floor before hitting a sliding kick to ASUKA’s head. Ohka goes up top and hits a diving crossbody, but ASUKA gets a shoulder up. Ohka goes up top again but ASUKA dropkicks her off the turnbuckle down to the floor, ASUKA goes off the ropes and sails out onto Ohka with a tope con hilo. Back in the ring, missile dropkick by ASUKA but her cover only gets two. ASUKA goes for a moonsault but Ohka gets her feet up to block it, Ohka picks up ASUKA and the two trade strikes. Superkick by ASUKA but Ohka nails a big boot, Ohka picks up ASUKA and drops her with a DDT. Cover by Ohka, but ASUKA kicks out. Ohka goes off the ropes but ASUKA catches her with a chokeslam, ASUKA goes off the ropes but Ohka grabs her and hits a chokebomb for two. Ohka and ASUKA trade elbows and then trade boots, dropkick by ASUKA and she gets a two count cover. Chokeslam by Ohka but ASUKA hits a rolling fireman’s carry toss, ASUKA goes up top but Ohka grabs her from behind. Running boot by Ohka, she joins ASUKA and she hits a superplex. Ohka goes to the turnbuckle as ASUKA kips up, dropkick by ASUKA and she hits a superkick followed by a gutwrench suplex. ASUKA goes off the ropes and goes for the springboard moonsault, but Ohka kicks her as she goes for the move. Running boot by Ohka, she picks up ASUKA and delivers a brainbuster for a two count. Ohka goes for a tiger suplex but ASUKA blocks it, running boot by Ohka but ASUKA ducks the next one and hits a superkick. Chokeslam by ASUKA, she goes up top and nails the moonsault, but Ohka barely kicks out of the cover. ASUKA goes up top again and this time delivers a Shooting Star Press, and she picks up the three count! ASUKA wins! Even with one match cut out and another I just didn’t review, this was a long show but top to bottom a solid one. WAVE’s roster isn’t great once you get past the top few wrestlers, but they compensated for that here by having Best Friends, Kaho Kobayashi, and Yoshiko joining to make the show more complete. 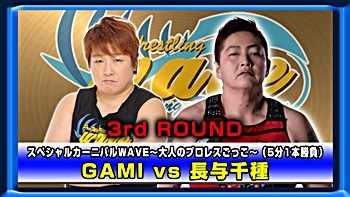 The GAMI/Nagayo matches really are purely for nostalgia and to make the event feel “bigger,” as the matches themselves ranged from bad to average (and I say that as a Chigusa Nagayo mark). Add in the comedy match and the Nagisa Nozaki tag match, and over half the card was pretty iffy in regards to entertainment value. The top three real matches delivered though, none reached that highest level but all were entertaining and they also were different styles while helped the flow of the event. If you can track the show down, there are several quality matches here worth watching, and also perhaps the beginning of ASUKA’s rise to the top of the promotion.